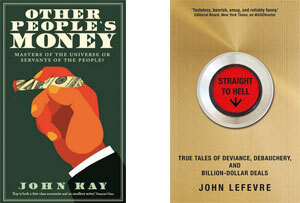 Other People's Money and Straight to Hell clearly reveal the greed and sleaze endemic in the financial world. But there is a way to stop the rot, says Philip Delves Broughton. Janet Yellen, the chair of the Federal Reserve Board, and arguably the most powerful woman in the world (squeaking out Angela Merkel) earned a salary last year which was 1% of that of Jamie Dimon, the chief executive of JP Morgan Chase. Dimon and Lloyd Blankfein, the chief executive of Goldman Sachs, are now estimated to be billionaires from careers managing large publicly traded banks - not founding, it should be noted, but simply managing. By contrast, Sir John Harvey-Jones, a chairman of the British chemicals giant ICI in the 1980s died in 2008 leaving an estate of just half a million pounds. There are roughly four financial lobbyists in Washington DC for every one member of Congress. If you have the slightest trace of doubt that the financial services industry hasn't wrapped its tentacles around the rest of society and is squeezing, then John Kay will put you right. A battle-hardened economist, he was hired in 2011 by the British government to lead a review of the UK equity markets. That experience proved the basis for Other People's Money, a courtly savaging of the financial world. Kay is no glib polemicist, firing giant dung balls over the fortifications of the City and Wall Street. He is an elite saboteur, a tunneller who before you know it has collapsed the walls. He believes that finance has a basic role in society: to ensure efficient payments, capital allocation, economic stability and security in how all of us manage our personal finances. But if you were to ask yourself, has any of that improved in recent years, the obvious answer is no. We see house prices spiralling beyond the reach of the first-time buyer, banks whose greatest customer innovation of the past 30 years remains the automated teller machine, and more rather than less volatility in our national economic fortunes. The basic concerns of Main Street, Kay writes, such as redundancy, unemployment, accident, illness, mortality and providing for old age, remain as frightening as ever. Finance has done nothing to mitigate these risks, and even made them worse. The financial crisis of 2008 offered policymakers a chance to reform this perverse system. Instead, by bailing out the banks and embarking on years of easy money, they have reinforced it. So what to do? Kay argues that finance used to be a relationship business, but has become a transactional one. Bank managers used to know their customers, and be capable of extending credit based on that personal knowledge. Now the credit-scoring function is assigned to impersonal algorithms. The securitisation of mortgages may have created a thriving new marketplace for financial institutions, but it reduced their knowledge of the housing market, which led to the crash of 2008. Those who run banks now go for a smash and grab raid for personal enrichment. Executives talk of increasing 'shareholder value' by which they mean generating short-term spikes in the share price at the expense of long-term growth and higher profitability. These are deeply rooted features of the financial sector. But Kay recommends a set of broad policy themes which over time might reverse the situation. First, is shortening the long chains of intermediation between market participants. At every step in that chain, consumers are getting fleeced. 'We need some of the things that Citigroup and Goldman Sachs do, but we do not need Citigroup and Goldman Sachs to do them. And many of the things done by Citigroup and Goldman Sachs do not need to be done at all,' he writes. Simpler institutions, less prone to fee-driven complexity, would be a vast improvement. He recommends higher standards of loyalty and prudence in client dealings, and criminal and civil penalties directed at individuals rather than organisations. Clapping more bankers in irons might help. As would treating finance like any other industry, by starving it of guarantees and near trillion dollar bailouts when things go awry. Any time spent with John LeFevre's account of life as a young banker at Citigroup in Asia only confirms Kay's thesis that the financial world is rotten to the core. LeFevre was low down the financial totem pole, syndicating Asian debt in Hong Kong. He describes a sleazy world of drugs, booze and prostitutes by the dozen. The bankers he fraternised with, he says, will one day end up running major financial institutions. Maybe. More likely they'll be washed up at 40. But it's a strange indictment of our society's current relationship to finance that LeFevre's description of bankers snorting and whoring by night seems trivial compared to Kay's blunderbuss of a case against their day jobs.